Saving Money on Home Energy - the Value of an EPC! saving you, the house-holder, significant amounts of money every year, forever! Remember, the savings below are for life! 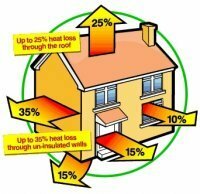 What you could save by Insulating your Loft (approx)! What you could save with Cavity Wall Insulation (approx)! Installing internal wall insulation onto all external walls can be expensive. But for the competent DIY person it is not prohibitive. The annual saving is around £380 on an average 3 bed-roomed semi-detached property. After installing 50mm internal insulation in my daughter's room we have noticed the difference. Her room is much warmer than the rest of the house and the radiator thermostat has been turned down from 5 to 3 - saving money! Changing your light bulbs to energy saving bulbs could save you up to £45 a year. Now, as energy prices are going up the time, is right to switch to new, better bulbs that light up instantly, don't flicker and don't cost you a fortune to run. To buy a good 4watt LED will cost in the region of £17. They last approximately 50 times longer than a halogen bulb. So, over the life of the bulb, you will save the higher purchase cost many times over not to mention the reduced impact on the environment. A public house has 35watt Halogens installed running 13hrs a day. The cost over 5 years, including changing bulbs, is £5,000. The same public house, changing their lights to 4 watt LEDs running for 13 hrs a day over 5 years will cost £550 pounds and no bulb changes, as the LEDs can last up to 15 years.